Berea, Kentucky, a small town of 15,000, is a step back in time. Not only does it have one of the oldest (1855) work colleges in Kentucky, it also has the historic Boone Tavern Hotel and Restaurant. A history of artisanship in both the college and the shops feature everything from basket making to weaving. Take the two-hour trip from Cincinnati on I-75 south, travel 35 miles south of Lexington and take exit 77 or 76 to Berea. Visitors can spend from one to three days visiting the sites at a relaxed pace. Things move more slowly in the south. I visited the sleepy town one recent rainy week. Here is the first part of a three-part story. Starting off in the pouring rain, I visited members of the artisan community with Kerri Lee Hensley, executive director of Berea Tourism Commission. Since Berea College offers a number of handcraft classes, this theme spills over into the town where over 40 artisans create and sell. You can see artists at work in their studios in Old Town. Kentucky General Assembly designated Berea as the folk arts and crafts capital of Kentucky in 1988. Hensley said Berea targets visitors, often snowbirds, who travel along I-75 from Detroit to Jacksonville, Florida with a stop in Berea. A graduate of Eastern Kentucky University, Hensley has been with the city for 18 years, now serving as executive director of Berea Tourism. 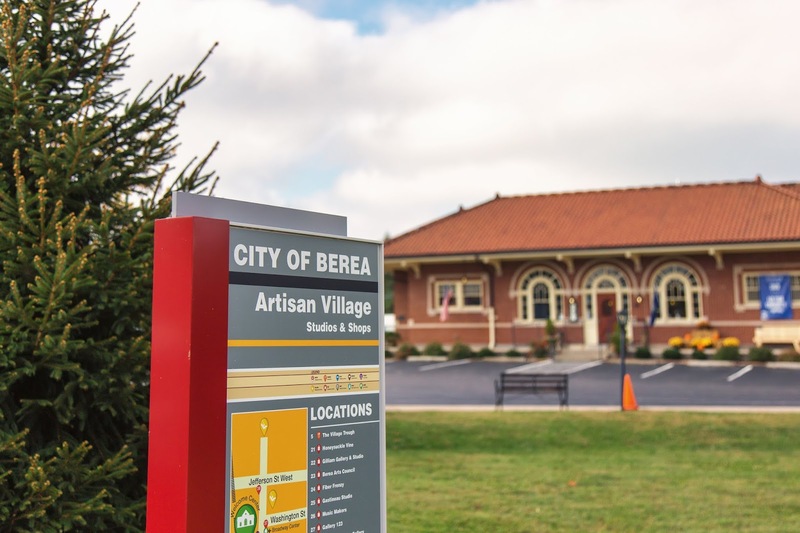 Her office is housed in the Berea Tourism Welcome Center located in an historic L&N Railroad Depot built in 1917 when the previous depot became too small. Jimmy Lou Jackson, 75, a native of Berea, is a lamp worker of handcrafted glass beads. Her great grandfather, Christopher Blanton, was an abolitionist who moved to Berea in the 1850's. He came because of the college. Two grandchildren and two great grandchildren attended the college. Jackson attended Berea College in the class of 1965. “My mother was a good artist,” Jackson said. “I didn’t know I could be an artist.” After working most of her career in clinical laboratories, she retired in her 50’s. She read an article about lamp working, named after oil lamps used previously in the craft, took a class in Louisville and was hooked. Jackson built a studio. “It was just a stress relief,” she said. Her business garnered enough income to provide her with health insurance as well as the pleasure of creating jewelry. “It’s leaving a legacy,” she said. The price point is reasonable. She even makes jewelry from cremated ashes. Yet, “I am getting older and don’t have the stamina,” Jackson said. Jackson observed visitors fall in love with Berea. “It’s small. You feel safe. It’s just a different feeling.” She also points to Appalachian music and studies centered around mountain experiences. Even though people associated with Berea have different viewpoints and lifestyles, people get along. 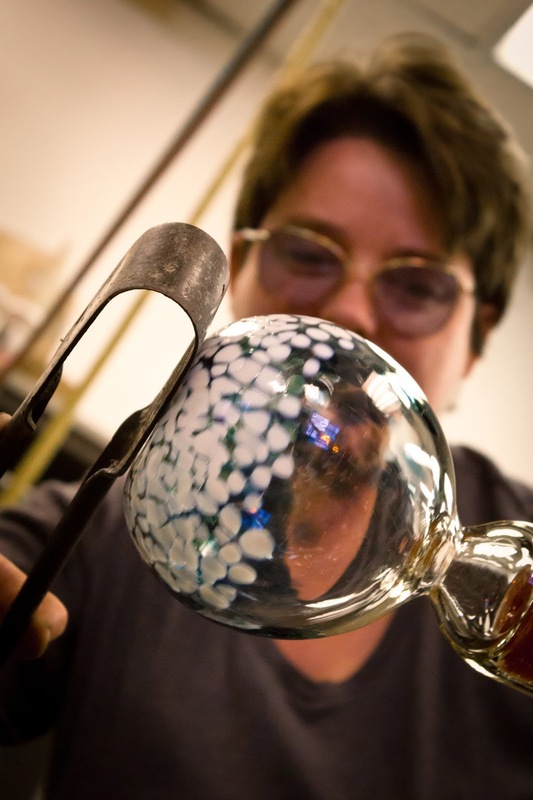 Another Berea artisan is Michelle Weston, who has had a glass blowing studio for 17 years. She did art fairs up and down I-75 and liked Berea. Weston received an MFA from Bowling Green State University in Ohio in 1994. Some of her big sellers are a pen holder and a starfish. The first year she turned a profit. Weston Glass Studio is also a wholesale business. Both parents retired in Berea. Her father Paul, formerly an electrical engineer, built the equipment for the shop. Weston said, “The Berea community is a diverse group of artisans” with a full range of artwork. 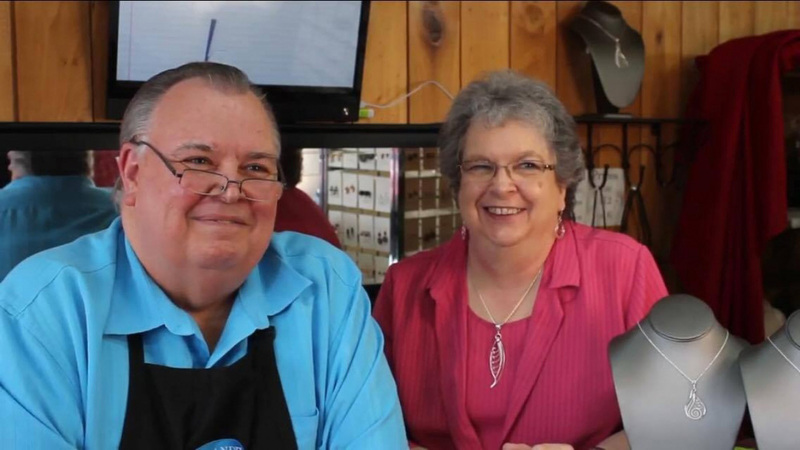 Bob and Judy Mattingly, both retired school teachers, have owned Lindsay Gallery for seven years. Jimmy Lou was a longtime friend, who pointed them in the direction of a studio for handmade jewelry. Mattingly makes unique necklaces and earrings, hand working each one. “I have always loved to make jewelry,” he said. “It was always in the back of my mind.” Even the first year, he was happy with the results. He has added rocks, bead strings and fossils. He took jewelry making classes to improve his skill set. He comments on the diversity of the artisans in Berea. Mattingly and his wife enjoy what they do. “My son tells people, ‘You failed retirement.’” The challenge he faces is his age, with hand issues affecting his ability to create the jewelry. They keep busy, however, working seven days a week from 10 to 5.